Home / Resources / Commercial Security / Do You Know Where Your Master Key Is? Companies that are looking for effective ways to upgrade their security might want to consider a professional master key system. With these new systems businesses can control who has access to their buildings through the use of a special key that is very difficult to duplicate. There are a variety of cylinder types and keyways available for companies that are interested in key management systems, and learning how they work goes a long way in truly improving the security of a facility. One of the most secure key management systems is when an Everest key has a factory cut Primus side biting. The reason this particular combination is so effective is that it offers the owner with geographic exclusivity. 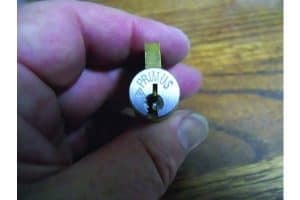 Primus cylinders have locks that are resistant to lock picking and can also be drill resistant. Unauthorized duplication is prevented with the use of key blank distribution. Another essential of an effective master key system is the option of combining patented attributes of keyways and cylinder types. One example of this is the Everest Restricted Conventional cylinder system, which is combined with the patented Everest key and a conventional cylinder. Both of these unique systems create a patented key system that utilizes a modestly priced cylinder. One thing to take note of with this combining feature is that Primus keys that have a higher security are capable of opening security cylinders that are of equivalent or lower security, but keys that have a lower security are not made with the capability to unlock a cylinder with a higher security. What this all boils down to is that users are free to come up with the perfect solution to fit their situation. Anyone who has several maintenance responsibilities is sure to appreciate this ability when it comes time to standardize or upgrade their current key systems. In the past, several different kinds of keyways and keys were utilized at several different facilities. The problem with this approach was that it lead to a decrease in key control, meaning that anyone could duplicate a key. In order to improve security, key management systems were implemented at all facilities. Today, having proper authorization is the only way that companies allow key blanks to be made. Only certain individuals have control over key distribution and cutting. Keyways are made with special geographic restrictions, such as within a two-digit zip code area. Everest keyways that have a higher security can be used on the exterior doors of facilities while regular keyways are used on interior doors. The reason the keyways are used this way is because an Everest Primus key will work with other Everest cylinders as well as Primus cylinders while an Everest key will only work on the same type of Everest cylinder. The security advantage of this is that interior doors or low security areas can be protected through the use of an Everest cylinder while areas that are more vulnerable can be protected through the use of a Primus cylinder. One Primus key can become the designated facility master key. Since Everest keys can’t work Primus cylinders, there is an extra measure of control over the amount of access that each individual user has. While key management systems might sound a bit complicated, using them becomes second nature once you get the hang of them. Now you know for a fact who has access to all company facilities, which means that you can better protect the things inside of your facilities as well as your employees. If you do decide to implement a key management system for your company, you best bet is to utilize one that has some form of patented key restriction since doing so is a good way to control key duplication. High security cylinders and keys will more than likely cost you more than you’re used to paying, but the great thing about these special keys and cylinders is that you can mix them with conventional cylinders as well as Primus cylinders. Something else to think about with this mix and match method is that it can go a long way in reducing your overall financial costs. For more information about commercial door security, master key systems and key management systems, get in touch with the professional and experienced experts of Great Valley Lockshop, the lock and key experts of Chester County and the entire Delaware Valley. 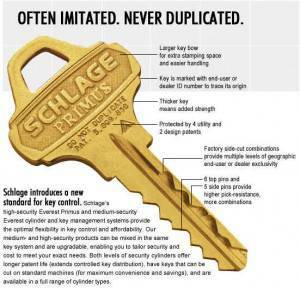 In business since 1973, we are Factory Authorized Distributors for Schlage, which means we can sell, install and service their full line of products, include the Everest Primus keyway products.